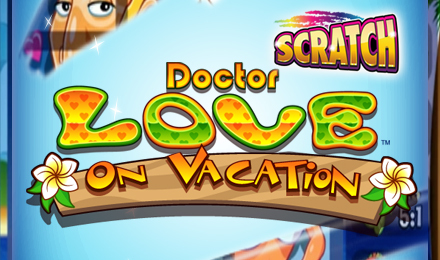 Doctor Love on Vacation Scratchcard has a generous RTP of 95.43%, and loads of mega multipliers. Don’t miss one more minute! Login today and get ready to win big! Enjoy some fun in the sun and big wins when you play Doctor Love on Vacation Scratchcard! So, grab your sun hat and play today! The goal of the game is to uncover 3 matching symbols. Each one has a different multiplier attached to it, with a tanned Doctor Love rewarding you the highest one. Other symbols include a suitcase, surfboard and Get Well floral wreath. Good luck!